Costa Cálida is the approximately 250 km stretch of Mediterranean coastline of the Spanish province of Murcia. This region has a micro-climate which features comparatively hot mean annual temperatures (and hence its name, Costa Calida "Warm Coast") and a relative degree of aridity (precipitation averaging less than 34 cm annually). The Costa Cálida extends from El Mojón in the north near the province of Alicante, to near the municipality of Águilas in the south bordering on the region of Almería province. The northern end of this coastline includes the Mar Menor ("Lesser Sea"), a coastal saltwater lagoon which at around 170 km2 is Europe's largest. The Mar Menor is separated from the Mediterranean by a 22km-long spit of land called La Manga, on which most of the tourism development for the region has been constructed. Cartagena and Mazarrón are two other important coastal towns in the region. Los Alcázares - pronounced Los Al-Katha-Res is a small, but expanding coastal spa town and former fishing village on the Western side of the Mar Menor. The town is an ideal mix of Northern Europeans (mainly UK) and Spanish. It is a very popular destination for sailing, windsurfing, kiteboarding and other water sports enthusiasts and there are numerous quality golf courses in the area. 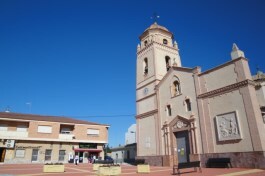 Los Alcázares plays host to numerous fiestas and festivals throughout the year. There are 2 large very popular weekly markets. Murcia, a city in south-eastern Spain, is the capital and most populous city of the Autonomous Community of the Region of Murcia, and the seventh largest city in the country. Murcia was founded by the Moors in 825 CE. 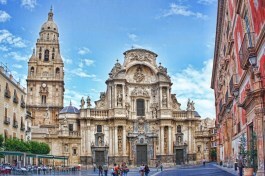 Highlights for visitors include the Cathedral of Murcia, a number of very beautiful baroque buildings and enjoying the renowned local cuisine. Murcia is the 6th largest city in Spain. To drive to Murcia city from the coast takes about 45 minutes. A very worthwhile visit with amazing architecture. Sucina is an authentic small village which has become surrounded by golf courses and resorts. The village consists of a mixture of old and new. The church and its square are still at the heart of the village and there are some very old houses to be found in the surrounding streets. There are also many new built houses, and the British influence can be seen in the church square with the cafes and bars. Sucina is a place where the Spanish and other Europeans mix very well. Only 15 minutes from San Javier airport. 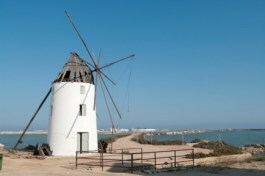 San Pedro, as it is more commonly known, is the most northerly of all the towns and villages that sit on the shores of the Mar Menor and is well worth a visit. There are lots of places to discover such as the marina and beaches that have a very rural feel. The Salinas Regional Park with its sand dunes and salt flats make it a very important wetland area for birds. It is easy to spend the whole day here at the park, marina, beach or in the town centre which is especially busy on a Monday which has its weekly market day.